The disaster which befell the Russian submarine Kursk in August 2000 caught the world’s attention and became a galvanising event in drawing renewed focus on submarine safety in the new century. Public empathy worldwide seemed to be driven by the belief that when a submarine goes down there is little that can be done for the crew. However, the history of successful submarine escape and rescue is as long as the history of the submarine itself. As submarine capabilities were gradually introduced in various navies around the world, a common question also emerged: what can be done in the event of a submerged accident that disables the submarine and prevents it returning to the surface? Essentially the answers remain the same. There are two options available for the crew of a submerged disabled submarine (DISSUB); escape or rescue. Escape is the process where the DISSUB’s crew leaves the boat and reaches the surface without external assistance; while rescue is undertaken by outside parties who remove the trapped crew from the submarine. At the dawn of the modern submarine age the initial focus was given to escape. Appearing around 1910 the first escape systems were derived from the breathing apparatus used by coal miners. These used a soda-lime cartridge which binds large quantities of carbon dioxide, cleaning the air breathed. The system utilised in the first submarine escape was the German Dräger . breathing apparatus, used when the submarine U3 sank in 1911.1 A number of similar systems followed; with the Davis Submarine Escape Apparatus (DSEA) being adopted by the Royal Navy in 1929 and the Momsen Lung used by the United States Navy (USN) until 1957. These escape systems remained prevalent until 1946 when the Royal Navy held an inquiry into escape from sunken submarines. The inquiry found no difference in survival rate between those who used a DSEA to escape and those that did so unaided. . As a result the DSEA was replaced with the ‘free ascent’ or ‘blow and go’ technique. Free ascent involved the crew member beginning the ascent with compressed air in their lungs. During the ascent the submariner breathed out at a controlled rate, allowing air to escape. This was a continual process, as the air expanded in the lungs due the decreasing pressure experienced en route to the surface. To limit the chance of being affected by decompression sickness, the escapee would use the bubbles of expelled air to judge the ascent by staying behind the smaller bubbles. To aid in the escape, a crew member might also use a life jacket or buoyant ring. In this case the rate of ascent was more rapid, which required the submariner to blow more rapidly throughout the journey to the surface. Buoyancy assisted free ascent continues to be practiced by Royal Australian Navy (RAN) submariners at the Submarine Escape and Rescue Centre at HMAS Stirling in Western Australia. After a brief flirtation with free ascent, the USN implemented the Steinke Hood in 1962. Literally a hood with a plastic face mask attached to a life jacket, the Steinke Hood allowed the crew member to breath air trapped in the hood on their ascent following escape. Breathing in the trapped air reduced the chances of contracting the bends if the user breathed normally. Free ascent and the Steinke Hood were favoured for their ease of use, but both systems had one glaring flaw: they failed to provide protection from the elements once the submariner reached the surface. This was apparent in 1950, when HMS Truculent sank following a collision with a merchant vessel within sight of the British shore. All of the 72 crew made it to the surface but only 15 survived with the rest swept out to sea by the tide and lost. These shortcomings were again evident with the Kosmsomlets disaster in 1989. Of the Soviet submarine’s 69 crew, 34 of those who made the ascent to the surface later died from hypothermia, heart failure or drowning. In the 1990s a large percentage of the world’s navies operating submarines, including the RAN, replaced their existing escape systems with either the British developed Submarine Escape Immersion Ensemble (SEIE) or local versions of that design. Using trapped air, similar to the Steinke Hood, the SEIE covers the user completely and importantly, provides thermal protection. Further, the suit has an inbuilt life raft that, once on the surface, can be linked to other life rafts. The suit allows for an escape from 185 metres. Prior to 1939 it was generally considered that if the crew could not escape the DISSUB then there was little that could be done to rescue them. During the 1920s some navies, in particular the USN, used salvage type operations with some success. However, these early rescue operations were conducted under ideal conditions which seldom occurred in practice. Often the amount of damage suffered by the submarine was unknown, which meant the submarine could not be moved as it might break apart in the process. Time was also a factor as the crew would have only three days of air at the most. Unfavourable conditions on the surface would prevent a salvage operation being carried out, as was the case in 1927 with the American submarine S-4 when gale force winds prevented the rescue from commencing in time. Due to the difficulties involved, salvage was abandoned as a means of rescue. Thinking on submarine rescue changed dramatically in 1939 with the sinking of USS Squalus. During seagoing trials an equipment failure resulted in the flooding of Squalus’ aft torpedo room, engine rooms and crew’s quarters killing 26 of the boat’s 59 crew instantly. Quick work by the remaining submariners prevented further flooding but the boat, now disabled, came to rest 74 metres below the surface. Since Squalus was carrying out the exercise in company with her sister ship, USS Sculpin, the DISSUB was quickly located and the alarm raised. What followed was the first true and, to this day, only successful submarine rescue. . The submarine rescue ship Falcon arrived on site with submarine salvage and rescue expert LCDR Charles B ‘Swede’ Momsen, USN, on board. Momsen, the man who invented the Momsen Lung, employed the newly developed McCann Rescue Chamber to great effect. The chamber was a large steel bell that was lowered from a surface vessel to cover the submarine’s escape hatch. Once attached it was possible to reduce air pressure and open the hatch to allow the trapped submariners to climb aboard. Using the chamber the 33 surviving crew members were rescued in four trips. The McCann Rescue Chamber System remains in service in several contemporary navies, including the USN and the Turkish Navy. Submarine rescue philosophies evolved further in the 1960s following the loss of two American nuclear powered submarines, US Ships Thresher and Scorpion, despite both boats being lost in waters that precluded escape or rescue. After considering a variety of options, including submarines with in-built escape pods (similar to the Russians) and submarines with front ends that could be blown to the surface, the USN developed the Deep Submergence Rescue Vehicle (DSRV). Entering service during the 1970s the DSRV, a manned mini-sub that mates with a DISSUB’s hatch and could carry 24 people at a time, offered great flexibility. With two built, one is maintained in an operational state so it can be flown in a C-5 cargo plane to a port nearest the DISSUB. It can then be placed onboard either a modified US or allied submarine. Operating from a submarine means that rough surface conditions or ice is less likely to adversely affect rescue operations. Other navies followed the lead of the USN and developed their own portable rescue capabilities. The Royal Navy’s LR5 Submarine Rescue Vehicle (SRV) is similar to the DSRV in most aspects but instead of using a modified vessel the LR5 uses a ship of opportunity as the Mother Ship. The LR5 is part of the UK’s multifaceted Submarine Rescue Service which also includes the Submarine Parachute Assistance Group (SPAG) and the Scorpio Remote Operated Vehicle (ROV). Composed of selected staff members from the submarine escape training tank and rapidly deployable, the SPAG functions as a first–on-site capability that provides assistance to a DISSUB or to those who have escaped. The obvious benefit of the SPAG is that timely assistance and coordination can be provided in order to avoid another Truculent or Kosmsomlets. The primary function of the Scorpio is to inspect and survey the DISSUB on the ocean floor. It can also clear debris from the site and record data such as water temperature, which is then used to assist in deciding on a suitable rescue strategy. Both the LR5 and DSRV are nearing the end of their lives with each expected to be replaced by new systems by the end of 2008. The LR5 will be replaced by the NATO Submarine Rescue Service (NSRS), a system developed jointly by Britain, France and Norway, while the USN is developing the Submarine Rescue Diving and Recompression System (SRDRS). Both systems are similar and will carry out rescue operations in three phases; reconnaissance, rescue and crew decompression. The reconnaissance stage will involve an ROV locating the DISSUB and recording data before a manned vessel conducts the rescue. The final stage, crew decompression, will involve a Transfer Under Pressure (TUP) chamber which enables the rescued submariners to be transferred from the rescue vehicle directly to a decompression chamber, thus preventing exposure to any unsafe atmospheric changes. While many of the developments in submarine rescue have been driven internationally, the RAN has taken the initiative in designing its own rescue system. Prior to 1995 the RAN had no organic submarine rescue system but did have a standing agreement with the USN for use of a DSRV in any emergency situation involving an RAN Oberon class submarine. The introduction of the Collins class coincided with the development of the Submarine Escape and Rescue Suite (SERS) which includes the Australian SRV Remora, the SRV’s launch and recovery system, and decompression chambers with a TUP capability. The capability to conduct a rescue is vital but counts for little if nations are unable to employ elements of another’s rescue capability, where that equipment might be better suited than their own. This was revealed in the post-Kursk disaster analysis. In the disaster’s aftermath the International Submarine Escape and Rescue Liaison Organisation (ISMERLO) was formed, with the primary objective to help coordinate future submarine rescue missions. Through its website, a nation with a DISSUB can note what assets are available, while nations that are capable can respond. 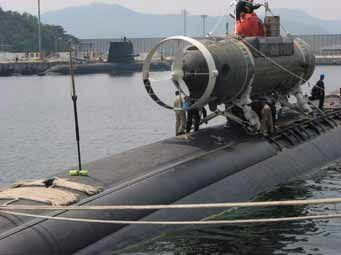 With over 40 countries now operating submarines the role of ISMERLO is critical. This is reflected in the fact that the organisation is an intrinsic part of submarine rescue exercises around the world, such as the NATO-sponsored BOLD MONARCH. The RAN also helps to promote regional cooperation on submarine rescue through its participation in Exercise PACIFIC REACH, the triennial Asia-Pacific submarine rescue exercise. In summary, early submarine operations relied on escape as the preferred method of recovering submariners from a disabled submarine. However, accidents and practical experience proved that rescue was also necessary. Momsen and other advocates of submarine rescue championed advancements in rescue systems, life support and recovery coordination. So if the unthinkable happens today, the chances of a successful rescue are significantly greater than they have ever been. ↑ A Jensen, ‘Why the best technology for escaping from a submarine is no technology’, <americanheritage.com/articles/magazine/it/1986_1_44.shtml> (4 July 2008). ↑ FW Lipscomb, The British submarine , Conway Maritime Press, Greenwich, 1975, p.186. ↑ F Owen, 'Submarine escape and rescue: The Australian solution', www.idpm.biz/downloads/submarine_escape.pdf (2 July 2008).